Apparently, mystery is well-liked by detective and not by a journalist. This spotted Koenigsegg is none other than a seriously mysterious example. On the aesthetic gradient, hypercar appears to be a One:1, where there are also other speculations doing rounds. Going by the words of the media which this Swedish carmaker lent to them, it has said to unveil the Regera at Geneva Motor show, further confusing the total atmosphere including us to arrive at a clear conclusion. 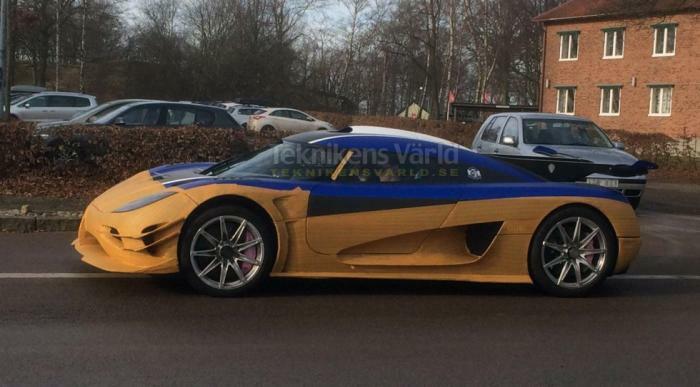 Well, as far as the rumours had spread this could be the Regera ‘Megacar’ that may hit the podium at the Switzerland; or else a customer’s One:1 that appears in the testing phase with unfinished details. However, we leave it upto you for deciding its fate. In the engine bay, One:1 holds a massive 5.0-liter V8 engine of the massive 1,341bhp and 1,371Nm of torque. All the said makes it worth to clock maximum 0-400 km/h sprint in 20 seconds. Fill the comments section by your opinions about it.